On 26 November 1760, in the Eligius Chapel of Vienna's St. Stephen's Cathedral, Joseph Haydn married Maria Anna Keller. The entry in the marriage records of the parish concerning Haydn's wedding was first published in 1875 by Carl Ferdinand Pohl in his book Joseph Haydn. Since Pohl's transcription contains several inaccuracies which have found their way into the Haydn literature – with Robbins Landon's translation of Pohl's edition in Haydn: The Early Years (London: Thames and Hudson, 1980, 248) being particularly flawed – I herewith present the very first correct transcription and translation of this document. Joseph Haydn's marriage entry in the records of St. Stephen's Cathedral (A-Wd, Tom. 59, fol. 417v). Dispensati in tribus / denunciationibus / Authoritate Ordinaria / deposito[que] utrimque / Libertatis juramento / Cop:[ulati] sunt 26ta / Novembris. Mit der Hochgeehrt= und Tugendreichen J[un]gfr:[au] Maria Anna / Kellerin, allhier gebürtig, des H[errn] Johann Peter Keller, / Hofbefreÿten Beruqueenmachers, und Elisabethæ Ux:[oris] / Ehe[liche]n Tochter. Testes: H:[err] Carl Schuncko, bürgl: Steinmetz=meister allhier / Und H:[err] Anton Buchholtz, bürgl: Markt= Richter. Dispensed with the permission of the Ordinariate from the three readings of the banns, they were united on 26 November after a mutual oath of being unmarried. The most respected Mr. Joseph Hayden, director of music at Titulo Count von Morzin, single, legitimate son of Mr. Mathias Hayden, master wheelwright and of his deceased wife Anna Maria. With the highly respected and virtuous maiden Maria Anna Keller, born here [i.e. in this parish], legitimate daughter of Mr. Johann Peter Keller, court-appointed wigmaker, and his wife Elisabeth. Witnesses: Mr. Carl Schuncko, civil master stonemason from here, and Mr. Anton Buchholtz, civil market judge. Robbins Landon certainly never saw Haydn's original marriage entry, because in his Chronicle 1757-60 (249), in the chapter about Haydn's marriage, Robbins Landon writes: "The fact that Haydn signs himself[sic!] boldly on the register of St. Stephen's (acting this time, as the local parish church as 'Music-Director'[sic!] at titl. [Herrn] Count v. Morzin', must mean that he was still in Morzin's service." Needless to say that Haydn did not sign himself in the marriage register. And "Music-Director" is not even the word that appears in the records. Robbins Landon's and Robert Franz Müller's musings (which were based on an obvious misunderstanding by Dies), as to whether Haydn kept his marriage secret from Count Morzin, are of course moot. Like every member of a nobleman's private staff, who wanted to get married, Haydn had to present a written declaration of consent from his employer. In the house of a wigmaker named Keller in Vienna (on the Landstraße) Haydn had frequently received support; he also gave music lessons to Keller's eldest daughter and his affection grew as the acquaintance became closer; but she entered a convent and now, because with his fixed salary his livelihood was sufficiently secured, Haydn decided, at the hairdresser's urgent persuasion and out of gratitude, to marry his second daughter." Because Haydn lived in the home of a wigmaker, who had two daughters, and the man had once said to him in jest: "Haydn, you should marry my eldest daughter! ", Haydn married this daughter (even against his affection, because the younger one was the real object of his love), just to get a wife soon. I want to address his wedding with Madame Annuccia[!] Keller, daughter of the abovementioned wigmaker. Remembering what he had promised, and what he had in this family, our master Joseph, being provided with an honorable and safe livelihood, entered this marriage which for some time made ​​him happy. In his biography of Haydn, Carl Ferdinand Pohl did not really add much to the information that his predecessors had provided. The accounts of Griesinger and Dies, however, seem to have strongly narrowed his focus as he delved into primary sources, such as the Vienna church records. C. F. Pohl: Joseph Haydn (1875), 195f. 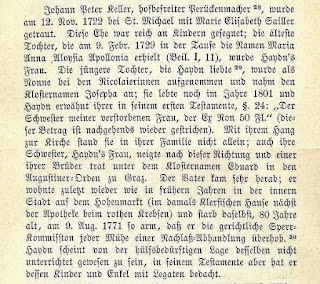 Johann Peter Keller, "hofbefreiter" [entitled to also work on commission from the Court] wigmaker, got married on 12 November 1722 in St. Michael's to Marie Elisabeth Sailler. This marriage was blessed with many children. The eldest daughter, who on 9 February 1729 was baptized Maria Anna Aloysia Apollonia (see appendix I,11), became Haydn's wife. The younger daughter, with whom Haydn was in love, was accepted as nun into the St. Nicholas Convent and took up the convent name Josepha. She was still alive in 1801 and Haydn mentions her in § 24 of his first will: "To my late wife's sister, the ex-nun 50 Fl." (this amount was later cancelled). She was not the only one in her family with an inclination towards the church; her sister, Haydn's wife, also showed this inclination and one of her brothers entered the Order of St. Augustine in Graz under the convent name Pater Eduard. On p. 380 of his book (footnote I,11 referred to in the above passage) Pohl published the baptismal entry of Keller's supposed eldest daughter (and Haydn's supposed wife) Maria Anna Aloysia Apollonia Keller in the records of St. Stephen's Cathedral. 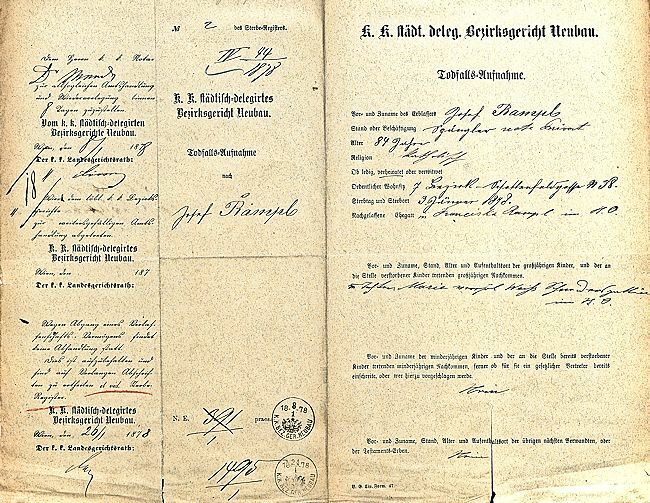 The original document shows that Pohl's transcription is flawed and incomplete. The father's profession is "hofb: Parouquenmacher" [no double f], the words after the godfather read "Kaÿ[serlicher] Portir maritus" (her husband, an Imperial doorman) and the name of the midwife "Barb:[ara] Adalmannin Obst:[etrix]" was obviously not important enough for Pohl to include it in his transcription. Pohl's identification was the last word on this issue, and as far as the identity of Haydn's wife is concerned, Haydn scholarship in general is still referring to this supposed gospel. Concerning Haydn's wife, James Webster writes in The New Grove Dictionary of Music and Musicians: "On 26 November 1760 Haydn was married to Maria Anna Aloysia Apollonia Keller (bap. 9 Feb 1729; d 20 March 1800); [...] The bride was the daughter of the wigmaker Johann Peter Keller, who is said variously to have assisted him in his years of poverty or employed him as a music teacher." In the other major musicological reference work, the German encyclopedia Musik in Geschichte und Gegenwart (vol. 8, col. 909), Georg Feder writes: "Die Braut war Maria Anna (oder Anna Maria) Aloisia Apollonia (Rufname: Anna) Keller 1729-1800, Tochter des Perückenmachers Johann Peter Keller in der Vorstadt Landstraße.". Laaber's 2010 Haydn-Lexikon contains a long article by Christin Heitmann about "Haydn (geb. Keller), Maria Anna (Aloysia Apollonia) getauft 9.2.1729", and in the 2002 Oxford Composer Companion on Haydn, where of course "Haydn, Maria Anna Aloysia Apollonia" makes a prominent appearance, Else Radant writes the following about Therese Keller: "Her uncle[sic] Georg Ignaz Keller (1699-1771) was a violinist in St. Stephen's and introduced Haydn to his brother, Johann Peter Keller, a professional wig maker. He and his wife had seven[sic!] children of whom Therese was the third daughter." As I have shown in 2012, in my article "The Haydn Hamburger", the musician Georg Ignaz Keller was not Therese Keller's uncle. He had no family relation to Haydn's bride. On the occasion of the work on my recent blogpost about Haydn's godchildren I sorted out all the data related to the Keller family that I had collected in the last ten years. When I drew up a list of all of Johann Peter Keller's children with their dates of birth and death, I realized that Maria Anna Aloysia Apollonia Keller could not have been Haydn's wife. Pohl's information concerning the identity of Frau Haydn is false and so is the whole Haydn literature on this issue, where Pohl's error has been repeated for the last 139 years. The proof that Maria Anna Aloysia Apollonia Keller was not Haydn's wife is of utmost simplicity: Maria Anna Aloysia Apollonia Keller already died at the age of fifteen months. The entry in the municipal death register concerning the death of Haydn's supposed wife Maria Anna Aloysia Apollonia Keller on 26 May 1730 (A-Wsa, Totenbeschreibamt, Totenbeschauprotokoll [henceforth TBP] 33, fol. 275v) . For the corresponding announcement in the Wiener Diarium see here. Dem Johann Peter Kellner, Hofbefr:[eiter] Paruquen= / machern, sein Kind Aloÿsia, ist in Fehrner:[ischen] Haus / am Hochenmarkt an der Zahnfrais b[e]s[c]h[au]t [worden], [alt] 5/4. Jahr. The wigmaker to the court Johann Peter Kellner's child Aloysia was inspected in Ferner's house on the Hoher Markt as having died of teething cramps at an age of 5/4 years. Because of this child's age of fifteen months, there can be no doubt that this is the daughter of Johann Peter Keller who was born on 9 February 1729 and is said to have become Haydn's wife. It is also interesting to learn that this child's forename was Aloisia and not Anna. Aloisia Keller was buried in the cemetery of St. Stephen's on the same day she had died. The entry concerning Aloysia Keller's burial in the Bahrleihbuch of St. Stephen's (A-Wd, Bahrleihbuch [henceforth BLB] 1730, fol. 125r). 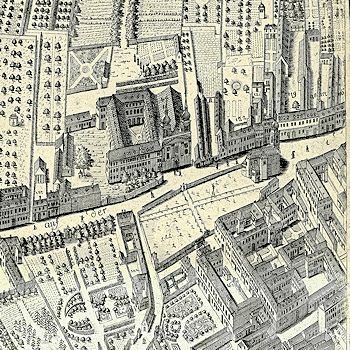 The "Fernerisches Hauß" was the so-called Leinwandhaus (today Hoher Markt 4) which at that time was owned by the the children of the cloth merchant Franz Jakob Ferner (1671-1712) and his wife Anna Catharina, née Barath (1774-1728). The building was remodelled in 1861 and destroyed in a fire after a bombing raid in April 1945. Grabstell . . . . . . . . . . ." 1 " –– "
Pahrtüchl . . . . . . . . . " –– " 45 "
1. mantl . . . . . . . . . . " –– " 12 "
Pohl's choice for the identity of Haydn's wife was basically arbitrary. He certainly did not conduct a systematic search in the Vienna church records. I suspect that he did not even do the research himself and got the information concerning the two sources from the parish archive of St. Stephen's, that he published, from somebody else. Had Pohl personally consulted the Cathedral's records, he would certainly have realized that Maria Anna Aloysia Apollonia Keller was not her parents' first daughter. Anybody who would have personally checked Johann Peter Keller's 1722 marriage entry in the records of St. Michael's, would immediately have looked into the following baptismal registers of this same parish. This is the standard procedure to find the earliest children of a marriage. Pohl did no such thing. He also was not aware of the basic fact that a child's "Rufname", the first name, by which it is addressed, cannot be determined from a baptismal entry, but only from a later marriage entry, or an entry in the death records. Considering the high birth rates in the early eighteenth century, doing research on a Viennese family from this time by checking only the baptismal records, but ignoring the death records, is – from a scholarly point of view – an almost pointless enterprise. The daughter of Johann Peter Keller that Haydn really married was Maria Anna Theresia Keller who was born on 25 September 1730, the seventh child of her parents, in the "Fernerisches Haus" on the Hoher Markt (today Hoher Markt 4). As Carpani rightly noted in 1812, her "Rufname" was to be Anna. 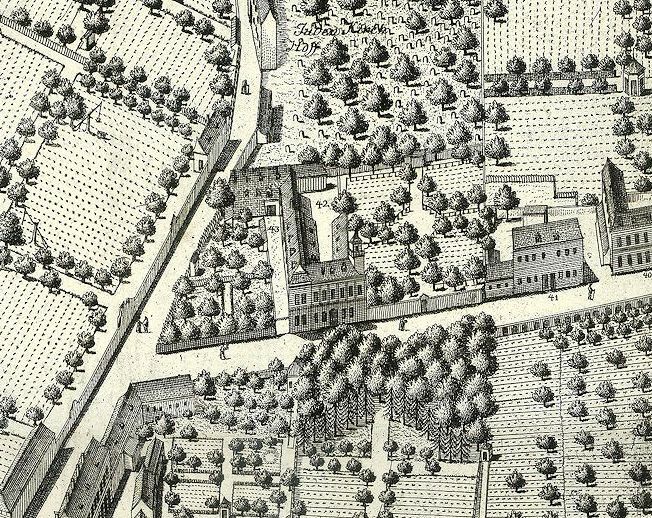 The birthplace of Haydn's wife (and the Keller family's main residence from 1730 until at least 1741), the "Fernerisches Haus am Hohen Markt" (to be numbered 526 in 1771) on Joseph Daniel von Huber's 1778 map of Vienna. Since Anna Keller signed her marriage contract and her first will "Maria Anna" (names that were also part of Aloisia's name) and appears as "Anna" in other documents, the mistaken identity never became apparent in documents from Haydn's later life. Joseph and Anna Haydn receiving the "Gewähr" (the right of ownership) for their house Windmühle No. 71 on 29 October 1793: "Herr Joseph Haydn, fürstlich Esterhazi:[scher] Capellmeister, und dessen Frau Ehewirthinn Anna empfangen mit magistratischer Bewilligung vom 29ten October dieses Jahrs zugleich die Gewähr um ein Haus und Grund N° 71 in der unteren Steingassen bey Gumpendorf [...]" (A-Wsa, Patrimonialherrschaften, B123/8, fol. 105r). Anna Keller's godparents were the surgeon of the I. & R. Hartschiers (the Emperor's life guard) Johann Franz Schlegelhofer and his wife Maria Elisabeth. Schlegelhofer had been born on 22 June1700 in the Lower Austrian town of Herzogenburg, son of Andreas Bernhard Schleglhover and his wife Maria Juditha. 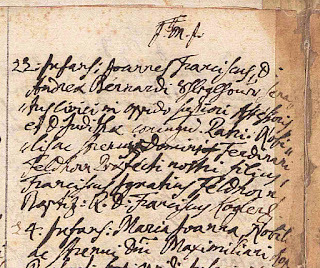 The entry concerning Johann Franz Schlegelhofer's baptism on 22 June 1700 in the church of the Herzogenburg Monastery (Herzogenburg 01,2,3/03, p. 4). The three letters above the entry mean "Jesus Maria Joseph". Between 22 December 1685 and 10 June 1708 Schlegelhofer's parents produced at least 11 children who were all born in Herzogenburg. On 3 September 1730 Schlegelhofer, who at that time was living in the building of the court chancellery, married Anna Maria Glass, née Klazenegg (Schotten, Tom. 24, fol. 211r), the widow of Franz Glass, a doorman in the service of Empress Maria Amalia. Glass and Anna Maria Klazenegg had married on 25 February 1716 (Schotten, Tom. 21, fol. 239v), and between 1720 and 1727 had six children, all of whom were still alive at the time of their father's death in 1729. Johann Franz Schlegelhofer died in the early hours of 28 October 1755 of "Blutbrechen" (blood vomitting) in the "Bischof-Hauß am Haÿdenschuß". This building, where in 1788 Lorenzo Da Ponte was to reside, has already been dealt with on this blog. The entry in the Vienna Totenbeschauprotokoll concerning Franz Schlegelhofer's death in 1755: "Schlegelhofer, Herr Johann Frantz, K:K: Hartschirn Chyrurgus, in Bischof-Hauß am Haÿdenschuß Nachts-Frühe umb 1/2 1. Uhr an Blutbrechen versch:[ieden], alt 55. Jahr." (A-Wsa, TBP 50/2, fol. 86r). Schlegelhofer's death led to a major reorganisation of the medical supply of the I. & R. Hartschiers (A-Whh, OMeA AA, Karton 49). Owing to the 1749-63 gap in the series of Sperrs-Relationen of the Obersthofmarschallamt, Schlegelhofer's probate file is not extant. To get an overview of the Keller offspring and to illustrate the flawed genealogical research that led to such a fundamental mix-up in Haydn's biography, we have to look at a complete list of Johann Peter Keller's fifteen children with their basic biographical dates (and their main forenames in bold type). Joseph Johann Thomas Keller, baptized on 15 July 1723 (A-Wstm, Tom. 8, 385), godparents: Thomas Goldt and Johann Georg Ottho. Joseph Keller became a court official and by 1785 was employed as registrant at the secret Court Chancellery and Latin Registry. On 18 October 1790 (St. Joseph ob der Laimgrube, Tom. 2, fol. 18) he married his housekeeper Anna Maria Eschenbrucker (1766-1802) who was 43 years his junior. His only child, Karl Joseph, was born on 20 January 1791 (A-Wstm, St. Peter, Tom. 1, 234) and died on 29 April 1805 (Pfarre Hernals, Tom. 5, fol. 142). A highly educated man, Joseph Keller owned a huge library (2,128 volumes) and was friends with many men of letters, such as the legendary singer Francesco Benucci. In 1797, owing to dementia, he physically attacked his wife and was brought into an asylum from which he was released after Joseph Haydn had submitted a written pledge in his favor. Joseph Keller died of exhaustion on 10 November 1801 in the "Postmeisterhaus" on the Landstraße (today Landstraßer Hauptstraße 61) (A-Wsa, TBP 112a, lit. CGK, fol. 121r), survived by his wife and his son Karl (A-Whh, RHR 104). Heinrich Anton Thomas Keller, baptized on 12 July 1724 (A-Wstm, Tom. 8, 528), godparents: Heinrich Reischmann and Thomas Gold; died on 3 November 1727 of "Kindsblattern" (chickenpox) (A-Wsa, TBP 31/1, fol. 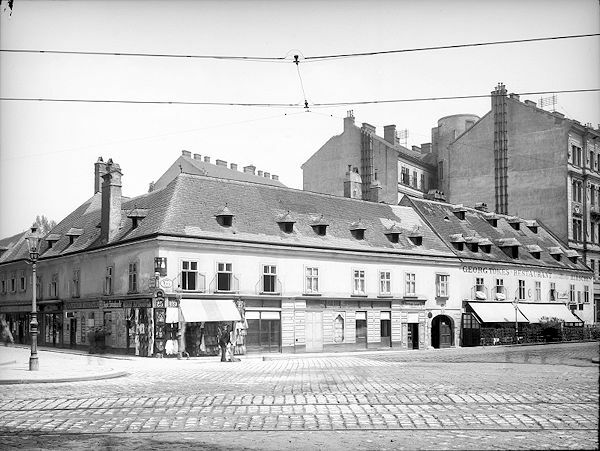 152v) at the "Fernerisches Haus am Graben", then owned by the cloth merchant Anton Carl Ferner (today Graben 21, torn down in 1834). Johann Georg Thomas Keller, baptized on 12 January 1726 (A-Wd, Tom. 63, fol. 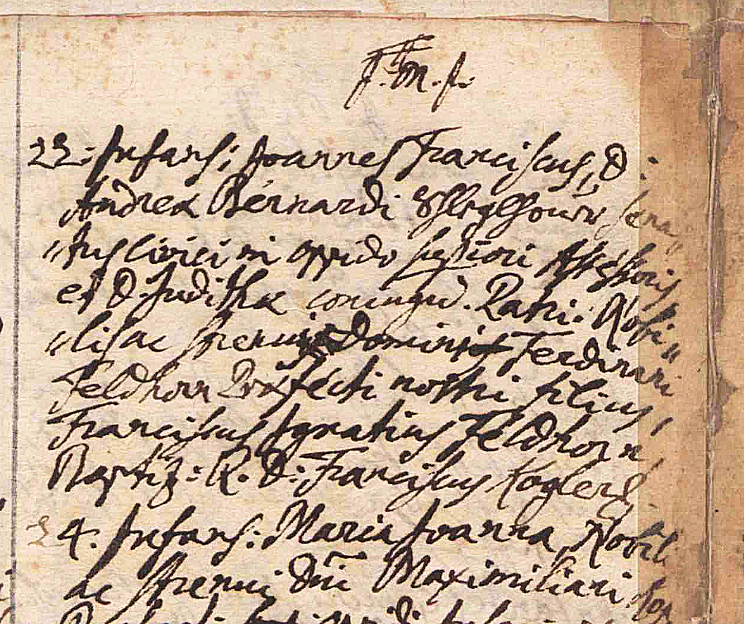 281v), godparents: Thomas Gold and Heinrich Reischmann; died on 1 October 1727 of "Zahn-Cathar" (tooth catarrh) at the "Fernerisches Haus am Graben" (A-Wsa, TBP 31/1, fol. 119v). Maria Barbara Helena Theresia Keller, baptized on 26 December 1726 (A-Wd, Tom. 64, fol. 100v), godparents: Barbara Osner and Anna Helena Reischmann. In January 1752 she married the future wigmaker Carl Scheiger. Two of her grandchildren were godchildren of Haydn. Her date of death is unknown. Maria Anna Elisabeth, baptized on 1 February 1728 (A-Wd, Tom. 64, fol. 397v), godparent: Anna Helena Reischmann. On 16 May 1752 she married the painter Joseph Bidermann (who died before 1795) with whom she had several children, of whom a son, Joseph, was still alive in 1819. She died on 3 July 1795 at the Hospital of the Order of Saint Elisabeth on the Landstraße (A-Wsa, Mag. ZG, A2, 3023/1795). Maria Anna Aloysia Apollonia Keller, baptized on 9 February 1729 (A-Wd, Tom. 65, fol. 221r), godparents: Maria and Thomas Glas. Pohl's wrong choice as Haydn's wife (see above). She died on 26 May 1730 (A-Wsa, TBP 33, fol. 275v). Maria Anna Theresia Keller, baptized on 25 September 1730 (A-Wd, Tom. 66, fol. 57v), godparents: Anna Maria and Johann Franz Schlegelhofer. She became Haydn's wife and died on 20 March 1800 in Baden (Baden, St. Stephan, Tom. 7, 113). Eleonora Maria Anna Keller, baptized on 8 January 1732 (A-Wd, Tom. 66, fol. 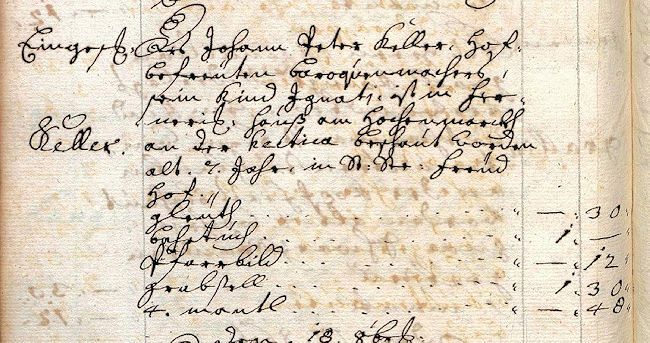 382v), godparents: Helena and Heinrich Reischmann, administrator at the Carmelite Convent of St. Joseph; died on 9 March 1732 of "Stickfrais" (whooping cough) at the "Fernerisches Haus am Hohen Markt" (A-Wsa, TBP 35, fol. 109v). Theresia Helena Keller, baptized on 20 May 1733 (A-Wd, Tom. 67, fol. 160r), godmother: Helena Reischmann. In 1755 she entered the convent of the Poor Clares in the Singerstraße (which was disbanded in 1783) and took her vows in 1756 as Sister Josepha. She died on 3 January 1819 at Leopoldstadt No. 446 (last CNo. 503, today Praterstraße 33). Ignaz Heinrich Keller, baptized on 10 November 1734 (A-Wd, Tom. 68, fol. 128v), godfather: Heinrich Reischmann (misspelled "Heischmann" in the records); died on 17 October 1741 of "Hectica" (hectic fever) at the "Fernerisches Haus am Hohen Markt" (A-Wsa, TBP 42, fol. 494v). The entry concerning the burial of Ignaz Keller on 17 October 1741 (A-Wd, BLB 1741, fol. 234v). 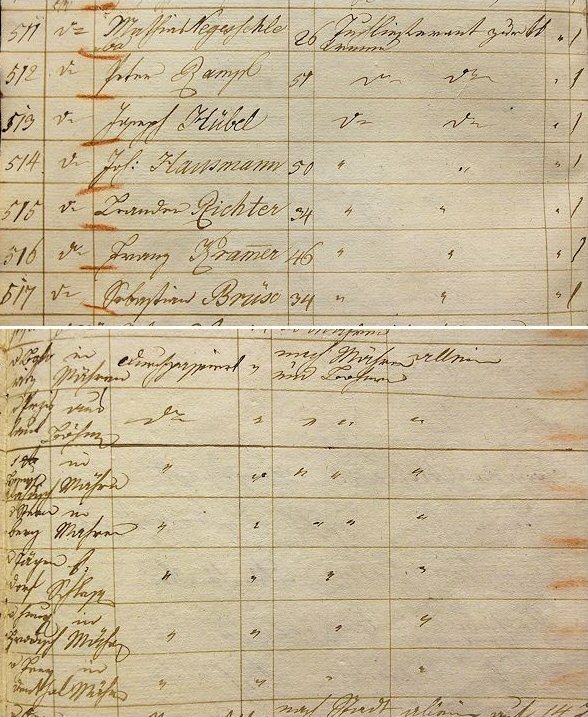 This is an example of several very similar documents concerning the burials of eight of Johann Peter Keller's children. Johann Franz Keller, baptized on 21 January 1736 (A-Wd, Tom. 69, fol. 138r), godparents: Johann Franz and Anna Maria Schlegelhofer. He joined the Order of Saint Augustine in Graz (at today's Stiegenkirche) and became a monk under the name Pater Eduard. His date of death is unknown. Johann Peter Anton Keller, baptized on 16 June 1738 (A-Wd, Tom. 71, fol. 64v), godfather: Anton Joachim "kayserlicher Camerdiener"; died of "Zahnfraisen" on 5 March 1739 at the "Fernerisches Haus am Hohen Markt" (A-Wsa, TBP 41, fol. 152v). Johann Anton Keller, baptized on 4 January 1741 (A-Wd, Tom. 72, fol. 364r), godfather: Anton Joachim "kayserlicher Camer Furir" (Imperial chamber fourier); died on 28 September 1741 "an der Zähnfrais in Fernerischen Hauß am Hohenmarckt" (A-Wsa, TBP 42, fol. 474r). Maria Catharina Aloysia Keller, baptized on 5 April 1743 (A-Wd, Tom. 74, fol. 112v), godmother: Maria Catharina Reischmann "Königliche Hatschierin" (Heinrich Reischmann's second wife). On 18 January 1766 Aloysia Keller married the wigmaker Johann Sommerfeld. She moved to Preßburg, had four daughters, Aloisia, Elisabeth, Anna and Franziska (who together inherited 200 gulden from Haydn) and after the death of her first husband married a certain Lindner. On 30 May 1778 she filed a lawsuit against Haydn and his wife because of an old loan that Haydn had been granted by her father. Owing to the loss of documents in the Eisenstadt archives, the outcome of this lawsuit is unknown. And so is Aloysia Lindner's date of death. The entry concerning the wedding of Johann Sommerfeld and Aloysia Keller on 18 January 1766 in St. Stephen's Cathedral. The groom's best man was the bride's brother-in-law, the wigmaker Carl Scheiger (1715-1803) (A-Wd, Tom. 63, fol. 298r). Anton Michael Wenzel Keller, baptized on 29 September 1744 (A-Wd, Tom. 75, fol. 137v), godfather: Anton Joachim "Königlicher Vice Hofquartirmeister" (deputy quartermaster at the Royal Court); died on 11 September 1747 "an der roten Ruhr" (of bloody dysentery) at his father's house, Landstraße No. 51 (A-Wsa, TBP 46, fol. 433r). The entry concerning the burial of Johann Peter Keller's last child Michael in the St. Nikolai cemetery on the Landstraße: "Einges: Keller Des H: Peter Keller Hofbefr: Parockhenmacher, sein Kind Michael, ist in der Ungergassen in sein Haus an d Ruhr bscht, alt 3 J: Landstras" (A-Wd, BLB 1747, fol. 162v). Keller's house was not located in the Ungargasse, but in the Raabengasse (today Beatrixgasse 21). The belated identification of his wife changes very little in Haydn's biography. The fact that his wife was 593 days younger than hitherto assumed, is of downright comforting irrelevance. What is really important, however, is how this discovery reflects on Haydn research in general which in the last 140 years has failed to resolve a basic biographical issue in the composer's life. It appears to be time to doubt every bit of widely accepted information in the literature. The popular belief that "we already know everything about the lives of famous composers" is a misconception. Unlike Mozart, who – as far as we know today – had only one godchild, Joseph Haydn served as godfather many times. His decades-long stay in Hungary as kapellmeister of Prince Esterházy and his friendship with many colleague musicians lead to his becoming godfather to several dozens of children. The normal way to present unknown godchildren of Haydn would be to simply list their names and dates of birth. But since I am totally corrupted by futile scholarly standards, the first thought that came to my mind while thinking about this topic is to answer a question that has never been answered in any of the splendid Haydn Handbooks and Haydn Lexica: who are the known godchildren of Joseph Haydn? The following list of Haydn's known godchildren was compiled from Viennese primary sources and the Haydn literature (C. F. Pohl 1875, Ernst Fritz Schmid 1932 and 1934, Endre Csatkai 1932 and 1960, Janos Harich 1964, Robert von Zahn 1988 and H. C. Robbins Landon 1976-80). Because information concerning Haydn's godchildren is unsystematically distributed in several publications, which in no case provide an exact source, this list (which is the first of its kind) is neither definite nor complete. If necessary it will be corrected or extended in the future. The exact sources are not given, because they are also missing in the secondary (so-called scholarly) literature. Joseph Peter Rampl was born on 7 May 1793 at 8 p.m., the seventh child of the music copyist Peter Rampl and his wife Carolina, née Malat, in the house Rossau No. 110, "Zur grünen Säule" ("At the Green Column", today Porzellangasse 4). He was baptized on the following day at Vienna's Servite Church. His godfather Joseph Haydn was unable to attend the ceremony and sent his ward, the 16-year-old musician (and son of Luigia Polzelli) Pietro Polzelli in his stead. The entry concerning the christening of Joseph Peter Rampl on 8 May 1793 at the Servite Church in Vienna: (Pfarre Rossau, Tom. 2, fol. 82). I found this entry on 30 August 1999. The entry concerning Joseph Peter Rampl's godfather and his proxy: "Podschelli Petrus, nomine Josephi Haiden, Capellæ Magistri." Closest relatives. A mother, Luigia Pollzelli, widow of a musician at Wieden No. 426, then a full brother Anton Pollzelli, musician-to-be, 14 years of age, whose legal guardian is Mr. Joseph Haydn, capellmeister in Gumpendorf in the Steingasse in his own house. Joseph Rampl's father, the copyist Peter Rampl, is still a somewhat enigmatic figure. Before his identification by Günter Thomas in 1998, he was known under the name "Anonymous 63" which in 1960 had been introduced by Dénes Bartha and László Somfai, who counted the "Kopist Anonym 63" among the absolutely authentic Haydn copyists. Copies of Haydn's work by Rampl cover a wide range, including the the fair copies of the Flute Trios Hob. IV:6*-11*, the Piano Trios Hob. XV:3-5, the Symphonies Nos. 80 and 81, the ouverture to Armida, the orchestral version of The Seven Last Words, the String Quartets Op. 50 and the copies of the Paris Symphonies (Nos. 82-87) which were used by the London publisher William Forster. Furthermore Rampl, together with Johann Elßler, produced the working score of The Creation which today is held by the Staatsbibliothek Berlin. Copies made by Rampl of music by other composers – as shown by Dexter Edge – include Mozart's "Misericordias Domini", K. 222, parts of the "autograph" of the version à 8 of Mozart's Wind Serenade in E flat, K. 375 (probably prepared at the behest of Constanze Mozart and Nissen), and orchestral parts of C. P. E. Bach’s oratorio Die Auferstehung und Himmelfahrt Jesu which were made for the performance of this oratorio in 1788 in Vienna. Peter Rampl is first referred to in Viennese sources on the occasion of his wedding to Caroline Malat on 14 September 1777 at Vienna's Schottenkirche. From the entry in the parish register we learn that he had been born in Pribislau (today Přibyslav) in the Vysočina Region, had come to Vienna in 1773, had moved to the Rossau in 1775, and was still working as musician at the time of his wedding. It is very likely that at the time of the wedding the bride was already pregnant. Aug.[ust] 1. / 24 2. / 31. 3. / Sept. 7. Spons. [us] Viennæ 4 ann. [is] in Paroch. [ia] 2 ann. [is] test. [imonium] habit tulit. Sponsa majorenn Viennæ / 1 ann. [o] Viennæ in Paroch. 3 mensib. [us] Sponsus majoren. testimonium Baptismi exhibuit / Sponsa minorenn. parentis consensum tulit. test. habit. tulit. Mr. Peter Rampel, a bachelor and musician, born in Bohemia in Primislau, residing in the Rossau in Mr. Höfer's house No. 42, son of the citizen Johann Rampel and his wife Anna, takes as wife Carolina Malat, unmarried, born in Augezt in Moravia, living in the Rossau No. 42, legitimate daughter of the former estate manager Prokop Malat and his deceased wife Luzia. [The banns were published on] August 24th, August 31st and September 7th. Witnesses: Jakob Winter apprentice carpenter living on the Wieden No. 123 and Franz Kloger apprentice carpenter living at Rossau No. 42. The groom has been living in Vienna for four years and in the parish for two years, for which he presented a certificate. The bride has been living one year in Vienna and three months in the parish. The groom is of legal age and has shown his baptismal certificate. The bride is a minor and brought her parents' declaration of consent. She also has a certificate which she presented. Peter Rampl's wife Carolina Malat was born on 5 November 1753 in the Moravian village of Újezd (then Augezt) near Znojmo. Between 1777 and 1786 Rampl is documented to have been living at the house Rossau No. 42 "Zum Weißen Wolfen" ("At the White Wolf", last CNo. 52, today Rotenlöwengasse 5). Rossau No. 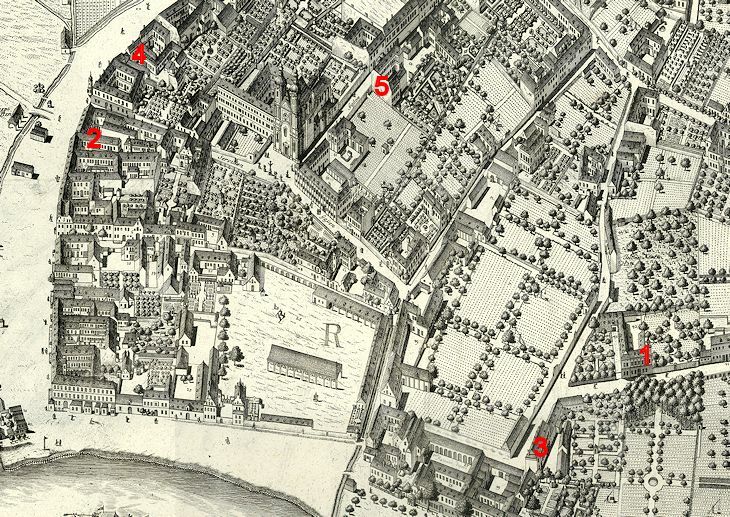 42 on Huber's 1778 map of Vienna. The Jewish cemetery is visible at the top. The house Rossau 42 "Zum Weißen Wolfen" on a photograph by August Stauda dating from 1903 (A-Wn, ST 1470F). This is the only existing photograph of the birthplace of the copyist Wenzel Rampl. The same view today. The double-winged building Rotenlöwengasse 5-7, which was built in 1904, belongs to the Klosterneuburg Monastery. In 1788 Peter Rampl is documented in the Steuerfassion as tenant on the second floor of the house Rossau No. 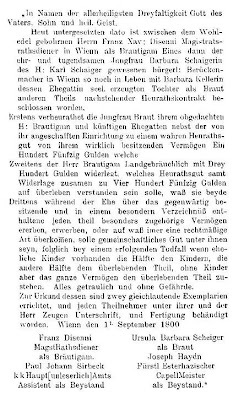 2, "Zum goldenen Hirschen" ("At the Golden Stag", today Berggasse 27), where he paid an annual rent of 24 gulden for "1 Zimmer, Küche und Boden" ("one room, one kitchen and one attic"). This amount was less than one tenth of the rent that Mozart paid at the same time for his apartment at Alsergrund 135 in about five minutes walking distance from Rampl's home. This marks a telling relation between the financial status of a composer and a music copyist. The houses Rossau Nos. 1 and 2 (Berggasse 25 and 27) on a 1903 photograph (A-Wn ST 1582F). 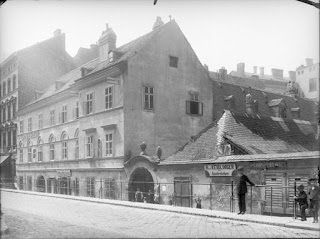 In 1788 Peter Rampl lived in the building on the right which housed the inn "Zum goldenen Hirschen". Both houses were torn down in 1904. By 1789 Rampl had moved to the house Rossau No. 37, "Zum See", by then also in the Rotenlöwengasse (today Seegasse 23, what was to be the birthplace of Georg Hellmesberger). Between 1789 and 1793 he moved to Rossau No. 110 where his son Joseph was born. The five currently known Rampl residences in the Rossau suburb: 1) No. 42 (1777-88), 2) No. 2 (1788), 3) No. 37 (1789), 4) No. 110 (1793, Joseph Rampl's birthplace) and 5) No. 68 (also part of 81, last number 145), where from about 1806 until her death on 9 August 1834 Rampl's widow lived with her son Wenzel. The wide street on the left towards the glacis is the Holzgasse (today's Berggasse), the Servite church and convent can be seen in the center. Regina, b. 18 April 1778, d. before 1834. On 14 October 1800 she married the Sollicitator (paralegal) Christian Friedrich Höser from Saxony (Pfarre Maria Rotunda, Tom. 2, p. 106f.). Three of Rampl's other children also had interesting godfathers: the godfather of Johann Nepomuk Wenzel, who was born in 1781 and already died at the age of three months, was the oboist and composer Johann Nepomuk Went (1745-1801). The godfather of Wenzel Rampl, who became a noted copyist, was the court violinist Jakob Sukowaty (3 April 1756 - 29 March 1794), a younger brother of the court copyist Wenzel Sukowaty (1746-1810). The godfather of Johann Nepomuk Rampl was the (at that time still) violinist Johann Nepomuk Tost (1759-1831), who was substituted by Rampl's colleague copyist Johann Elßler (1769-1843). Time and place of Peter Rampl's death are still unknown. Since his death is not registered in the Viennese sources, it is obvious that he did not die in Vienna. His sudden disappearance had been completely mysterious until in August 2002 I was able to find an entry in the Passprotokoll of the Vienna Konskriptionsamt, i.e. the protocol of passports that were issued by the Vienna Magistracy. This entry proves that in 1800 Peter Rampl had given up his job as copyist and left Vienna for Moravia and Bohemia to deliver cloth to the Austrian military. In my opinion he was hired by his friend Johann Tost who in 1791 had quit his job as musician and with his wife's money had established a trading firm for various goods, such as cloth and wine. Rampl left Vienna on 20 December 1800, together with six other men who in the protocol are all described as "Tuchlieferant zur kk Armee". This entry in the passport protocol is the only known document that provides Rampl's approximate age. 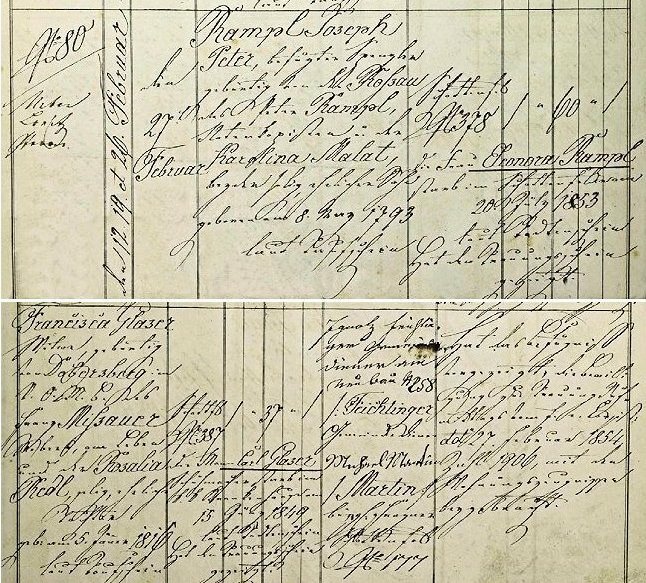 51-year-old Peter Rampl and six other individuals, registered on 20 December 1800 as recipients of passports as "cloth purveyors for the I & R Army to Moravia and Bohemia, alone" (A-Wsa, Konskriptionsamt, Passprotokoll B 4/1, fol. 674). The business enterprise of Johann Nepomuk Tost will be the subject of a future blogpost. Peter Rampl never returned to Vienna and probably died in Bohemia or Moravia. On a conscription sheet for the house Rossau No. 145, which was drawn up around 1806, his wife is already referred to as widow. Haydn's godson Joseph Rampl completed a tinsmith apprenticeship before he was drafted into the Army in November 1812. 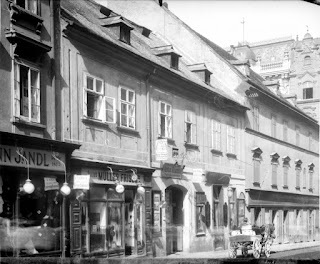 After his service with the Austrian Landwehr, he was appointed "befugter Spengler" in 1828 and took up a tinsmith business at the house Neustift 102 (today Zieglergasse 78). Joseph Rampl was married twice. On 5 February 1829 he married the maidservant Eleonora Rogner, a native of Großgerungs in Lower Austria. His brother Johann, also a "befugter Spengler" (authorized tinsmith), served as his best man. The entry concerning Joseph Rampl's and Eleonora Rogner's wedding in 1829 at the Servite Church (Pfarre Rossau, Tom. 4, fol. 65). The profession of the bride's witness Joseph Gamper was "Wicktoallihendler" (grocer). The bride had been born on 8 February 1797 in Groß Gerungs No. 62 (A-SP, Groß Gerungs Tom. 7, fol. 23). When Wenzel Rampl – a music copyist of note like his father – got married for the second time in 1830, his younger brother Joseph served as his best man. Joseph Rampl's signature ("befugter Spengler") as best man of his brother Wenzel on 25 January 1830 in the marriage register of the Schotten parish. The lower three lines are the handwriting of the parish priest Peter Selos (Pfarre Schotten Tom. 44, fol. 78). The best man at Wenzel Rampl's first wedding on 26 February 1811 had also been a person of interest: Beethoven's copyist Wenzel Schlemmer (1760-1823). Joseph Rampl's first marriage produced no children that reached adulthood. Joseph Rampl's first wife Eleonora died of heart failure on 20 July 1853 at Schottenfeld 378 (today Schottenfeldgasse 38). Rampl's second wedding took place on 27 February 1854 in the Schottenfeld parish church. The bride was Franziska Glaser, née Missauer (born on 5 January 1816 in Dobersberg), widow of the shoemaker Carl Glaser (1811-1849). On 20 November 1854 sixty-one year old Joseph Rampl and his second wife had a son named Joseph Carl who already died at the age of 15 months of "Zahnfraisen" (toothing cramps). Joseph Rampl, Haydn's last surviving godson, died on 3 January 1878 of old age at his home at Schottenfeldgasse 38. Joseph Rampl was survived by his wife Franziska. He was buried on 5 January 1878 in the Schmelz cemetery. Joseph Rampl's widow Franziska died of tuberculosis on 14 November 1887 at Schottenfeldgasse 53 (Pfarre Schottenfeld, Tom. 65, fol. 81, and A-Wsa, BG Neubau, A4, 1415/1887). Haydn's godson Joseph Carl Franz Disenni was born on 16 October 1801 in the house Wieden 423 ("Maria Empfängnis", today Margaretenstraße 22), first child of the city official Franz Disenni and his wife Ursula Barbara, née Scheiger. Because Joseph Haydn at that time was in Eisenstadt (see his letters to George Thomson and the one written on 18 October 1801 to the Dutch society Felix Meritis), the child's uncle, the silversmith Carl Scheiger, stood proxy for the composer at the ceremony in the Paulanerkirche. Jahr Monat Tag den 16 Oktbr. 801. Wohnung und Nro. des Hauses. 423. Namen der Getauften. Joseph Carl Franz. Vaters Namen und Kondition oder Karakter. Franz Disenni Magistrats Beamter. Mutters Tauf= und Zunamen. Ursula Barbara Scheiger. H[errn] Joseph Haydn Doktor der Tonkunst. 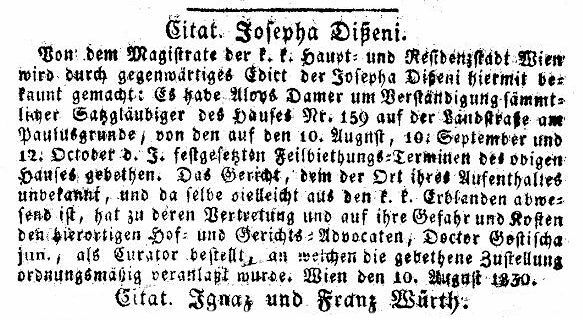 The child Joseph Disenni already died on 18 February 1802 of "Zahnfraisen" (toothing cramps). Joseph Carl Franz Disenni's family relationship to Haydn was similar to the relationship of the six Wimmer children in the above list of godchildren who were grandchildren of Haydn's eldest sister Maria Anna Franziska. The godchild Joseph Disenni was a grandnephew of Haydn's wife. To explain the family connection we have to go back into the first half of the eighteenth century, when Haydn's future father-in-law, the wigmaker Johann Peter Keller (ca. 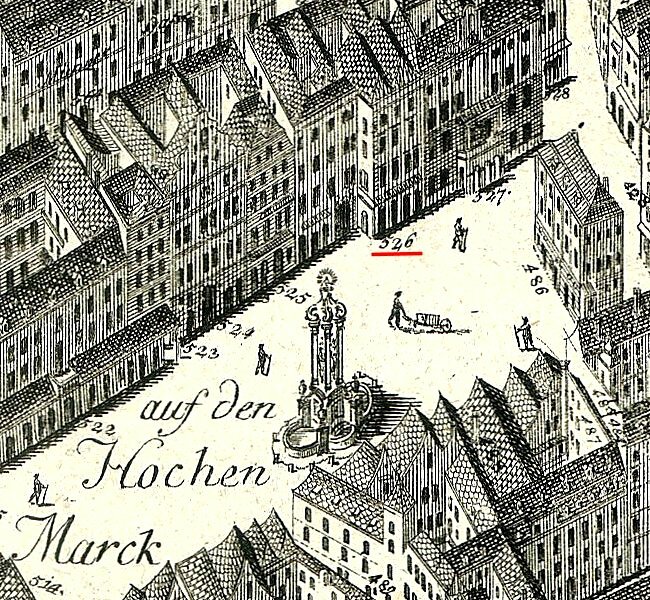 1691-1771) and his wife Maria (née Seiller), whom Keller had married on 12 November 1722, started a family in the "Fernerisches Haus" on Vienna's Graben (today Graben 21) and the "Leinwandhaus" on the Hoher Markt (today Hoher Markt 4) which at that time also belonged to a member of the Ferner family. Between 1723 and 1744 Johann Peter Keller and his wife had fifteen children (since most of the information in the Haydn literature concerning these children is wrong, I shall deal with them in a future blogpost). Only five of Keller's seven daughters reached adulthood: one became a nun, one married the painter Joseph Bidermann, one became the wife of Haydn, and two of them, following their father's professional environment, were married off to wigmakers. According to Albert Christoph Dies Johann Peter Keller said to his future son-in-law: "Haydn, you should marry my eldest daughter!" Dies's information is false and so is Griesinger's who in his Biographische Notizen über Joseph Haydn writes: "Haydn gave music lessons to Keller's eldest daughter and his affection grew as the acquaintance became closer; but she entered a convent and now, because with his fixed salary his livelihood was sufficiently secured, Haydn decided, at the hairdresser's urgent persuasion and out of gratitude, to marry his second daughter." Theresia Helena Keller (1733-1819), whom Haydn allegedly had fallen in love with and who in 1755 joined the order of the Poor Clares, was not Keller's eldest daughter, but his sixth. Keller's eldest daughter was Maria Barbara Helena Theresia who was born on 26 December 1726. Haydn must have had a close relationship to Barbara Keller as well. Maybe she also had received music lessons from him. 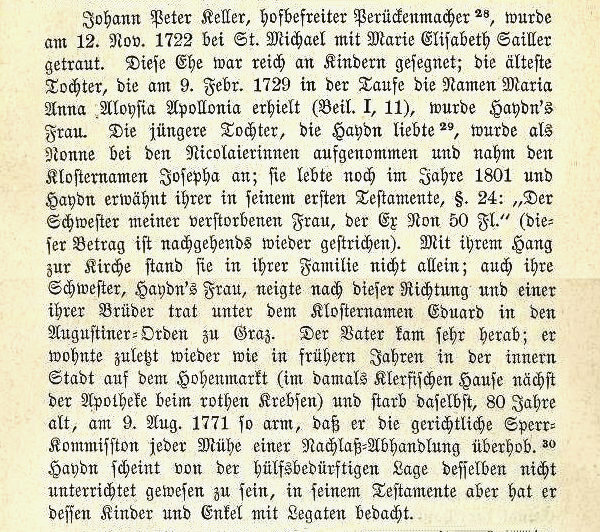 The entry concerning the baptism of Johann Peter Keller's first daughter and Haydn's future sister-in-law Barbara Keller on 26 December 1726 at St. Stephen's Cathedral (A-Wd, Tom. 64, fol. 100v). The godmothers were Barbara Osner, wife of a "hofbefreiter" confectioner and Anna Helena Reischmann, née Achamer, wife of the administrator of the St. Joseph Monastery. In January 1752 Barbara Keller married the "angehenden bürgerlichen Perückenmacher" (soon-to-be civil wigmaker) Carl Scheicher (also Scheiger). The entry concerning the wedding of the Carl Scheicher (Scheiger) and Haydn's sister-in-law Barbara Keller in January 1752 at St. Stephen's. The exact date of the ceremony was not registered. Keller's best man, the wigmaker Joseph Fürst, had also married the daughter of a wigmaker (A-Wd, Tom. 55, fol. 91v). An entry in the prenotation register ("Vormerkungs Buch") of Vienna's wigmakers' guild shows that Carl Scheiger opened his business on 1 February 1752. Carl Scheicher was the son of the "hofbefreiter" tailor Johann Caspar Scheicher (Scheücher), who had been born on 23 December 1669, also son of a tailor, in Lohnfeld (today Bad Leonfelden) in Upper Austria (A-LIa, Bad Leonfelden, Tom. 1, p. 73). "Hofbefreit" meant that a craftsman enjoyed the permission to work as a master on commission directly from the Imperial Court. Johann Scheicher had come to Vienna prior to November 1707, when he married Catharina Nickl at St. Stephen's (A-Wd, Tom. 37, p. 172). Carl Hippolyt Nepomuk (13 August 1755, Joseph von Vogt [Directorial-Concipist]). Carl Scheiger was the silversmith, who at his nephew's baptism stood proxy for Haydn. On 10 February 1800 he served as best man at the wedding of Haydn's copyist Johann Elßler and Theresia Prinster (Pfarre Gumpendorf, Tom. 13, p. 323f). Scheiger died on 15 January 1820, his widow Theresia died on 19 August 1836. Joseph Carl Borromäus (6 July 1764, Joseph and Elisabeth Bidermann [Haydn's sister-in-law and her painter husband]) Joseph Scheiger was the "blödsinniger Bruder der verheuratheten Düsseni", to whom Haydn in 1801 originally bequeathed 100 fl in his first will. On 1 September 1800, while Haydn was still in Eisenstadt, we find his name as a witness to the marriage in Vienna of his[sic] niece, Barbara Scheiger, and the Magistratsdiener[sic] (city government official) Franz Xaver Disenni; from the wording of the document, Haydn must clearly have signed it in absentia or in anticipation before he left the city. In the Addenda and Errata of his Chronicle (The Early Years, 1980, p. 642) Robbins Landon presented an updated hypothesis, suggesting that Haydn actually went to Vienna in September 1800: "[The document] shows beyond doubt that Haydn was physically present at the wedding; he probably took two days off from his duties at Eisenstadt." The actual entry concerning this wedding in the records of the Paulanerkirche on the Wieden (for which Haydn scholars never showed any interest) proves that Haydn did not go to Vienna in September 1800 to attend the wedding. The contract was drawn up on 1 September 1800, but the wedding ceremony proper took place but on 13 January 1801, when Haydn was already in Vienna (on 16 January 1801 he conducted a benefit performance of the Schöpfung in the Vienna Redoutensaal). On 13 January 1801 he must also have signed the marriage contract. The entry concerning Franz Disenni's and Barbara Scheiger's wedding on 13 January 1801 in the Paulanerkirche with Haydn's signature as witness of the bride (Pfarre Wieden, Tom. 2, fol. 293). This entry, which I discovered on 16 April 2010, is not listed in Herbert A. Mansfeld's book Index Nominum ex libris copulatorum Vindobonensibus and is therefore not registered in the digital database of Viennese marriages. Monat Täge Joseph Straßer Coop[era]t[o]r. den 13 Jänner 801. Namen und Stand. Franz Disenny ma= gistratischer Raths= diener. Namen und Stand. Barbara Scheiger Perückenma= chers Tochter. Nro. des Hauses und des Ortes. auf der Wieden 423. Joseph Haydnmpia Fürst Esterha= zischer Capell Meister als Beÿstand. 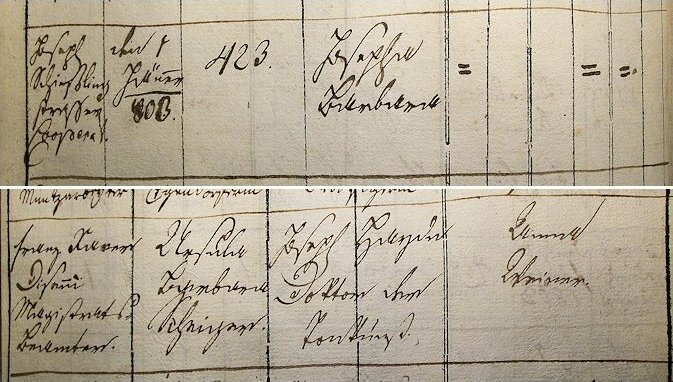 Paul Johann Sirbeck's and Joseph Haydn's signatures as witnesses to the wedding of Franz Disenni and Barbara Scheiger on 13 January 1801. Sirbeck wrote "O. B Zimentirung" under his name to which Haydn added the "s", the word "Beamter" and the horizontal line (Pfarre Wieden, Tom. 2, fol. 293). 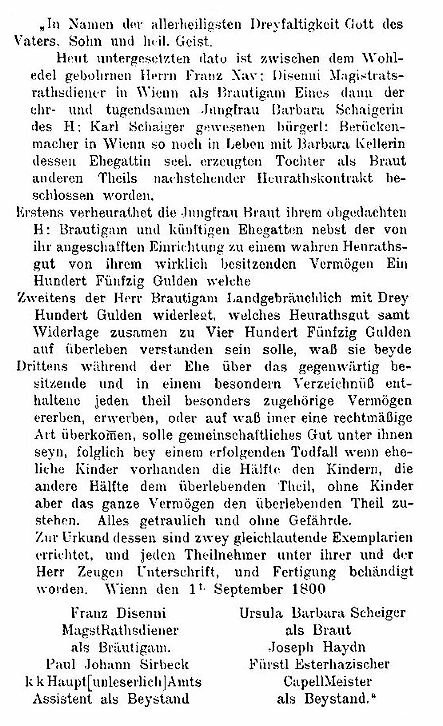 Franz Disenni's marriage contract was first published on 30 September 1915 by Max Unger in the Neue Zeitschrift für Musik, in an article titled "Musikerbriefe aus Josef Liebeskinds Sammlung". In 1927 the document was sold by Karl Ernst Henrici at the auction of Liebeskind's autograph collection and in April 1928 it was sold again by the book dealer V. A. Heck in Vienna. The first publication of Franz Disenni's and Ursula Barbara Scheiger's marriage contract (Neue Zeitschrift für Musik, Leipzig, 82. Jahrg. , p. 307). The missing word marked "unleserlich" in Paul Johann Sirbeck's signature is "Zimentirungs". When in 1980 Robbins Landon published a translation of the contract in his Addenda and Errata of Haydn: The Years of The Creation, he was unaware of Unger's earlier publication. He had received the text of the document through the offices of Otto E. Albrecht from the owner, "a collector in New Jersey, who wanted to remain anonymous". What follows is Robbins Landon's translation with the mistranscriptions and mistranslations corrected. Robbins Landon, for instance, misunderstood the words "gewesener Perückenmacher" and, ignoring the words "so noch in Leben", assumed that the bride's father was already deceased. One sentence of the contract is missing altogether in Robbins Landon's edition and the witness Paul Sirbeck was misread as "Siebert". In the name of the Most Holy Trinity, God the Father, Son and Holy Spirit. Today on the date given below, between the well born Mr. Franz Xav:[er] Disenni, servant at the City Council in Vienna as the groom and first party and the honorable and virtuous maiden Barbara Schaiger, daughter of the retired and stil living civil wigmaker Karl Schaiger and his wife, the late Barbara Keller, as second party, the following marriage contract has been concluded. Thirdly, will acquire and inherit or gain in any other legal way during their marriage in addition to their current assets, which are recorded in a special inventory, should be their joint property, thus in case one party should pass away and there are legitimate children, one half of the joint assets should go to the children, the other half to the surviving party. If there are no children the entire property should belong to the surviving party. Everything in confidence and without risk. In verification of this two identical copies were drawn up and handed to both parties with their and the gentlemen witnesses' signatures and seals. Vienna, on September 1st, 1800.
Who were Franz Disenni and his best man Paul Johann Sirbeck? Franz Xaver Disenni was born around 1760 in Görz (today Gorizia in Friuli-Venezia Giulia), son of Joseph Valentin Disenni (1711-1785) and his wife Cäcilia, née Spruck. The Disennis hailed from the Pustertal where Franz Disenni's grandfather had been "Obereinnehmer" (head tax collector) (A-Wd, Tom. 57, fol. 331v). Franz Disenni was born in Görz, because his father was stationed there as "General-Kriegs-Commissariats Officier". Franz Disenni had three siblings: Joseph Disenni (1763-after 1815), who in 1793 was a "Frauenputzhändler" (dealer of women's finery) and by 1805 worked as usher at the Court Theater. Maria Helena Disenni, who on 23 May 1784 married the "K.K. Hofkriegsraths=Registrant" Johann Joseph Thomas (A-Wd, Tom. 75, fol. 204v) and Catharina di Siena[!] 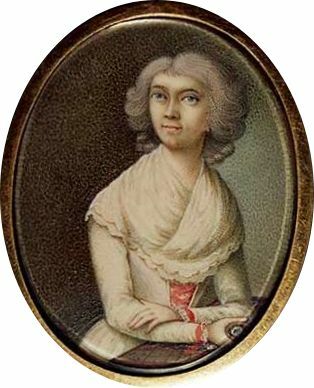 Anastasia Disenni (1763-1814), who on 24 July 1781 became the wife of the "K.K. Zimmentirungs Hauptamts Assistent" Paul Johann Sirbeck, thus establishing the connection between the two families. Sirbeck had been born around 1732 in the Hungarian town of Szentgotthárd and had moved to Vienna in 1769. The seals and signatures on Paul Johann Sirbeck's and Catharina Disenni's 1781 marriage contract. Joseph Valentin Disenni signed "alß Vatter und Gerhab der Braut" ("as father and guardian of the bride") (A-Wsa, Mag. ZG, A10, 585/1814). In 1790 Sirbeck was also the best man of his brother-in-law Joseph Disenni (Pfarre Wieden, Tom. 1, fol. 163). On 25 June 1783 Sirbeck and his father-in-law bought the small house Stadt No. 1231 on the Neuthorbastei, "nächst dem Fischmarkt", which, after Joseph Valentin Disenni's death on 25 May 1785 (A-Wsa, TBP 85, lit. DT, fol. 17r), went to Sirbeck and his sister-in-law Helena Thomas. In 1787 Sirbeck and his wife bought the other half and in 1815 Franz and Joseph Disenni inherited the whole building (at that time valued at 6,300 fl) and immediately sold it. Catharina Sirbeck died on 5 October 1814 and was followed by her husband Paul Johann on 7 October 1815. Since they had no children, Franz and Joseph Disenni were Sirbeck's universal heirs. In 1803 Franz and Barbara Disenni had a second child whose godfather was also Joseph Haydn. 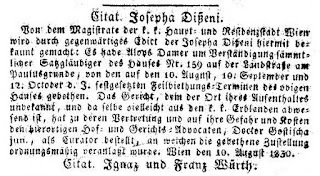 Josepha Barbara Disenni was born on 1 January 1803 and also baptized at the Paulanerkirche. This time the prominent godfather was in Vienna and could take part in the ceremony. Jahr Monat Tag den 1 Jäner 803. Namen der Getauften. Josepha Barbara. Vaters Namen und Kondition oder Karakter. Franz Xaver Diseni Magistrats= Beamter. Namen Stand Joseph Haydn Doktor der Tonkunst. Owing to a number of missing sources the following events in the Disenni family are a little difficult to ascertain. On 22 April 1803 the retired wigmaker (and grandfather of Haydn's two Disenni godchildren) Carl Scheiger died at an age of 88 at the home of his son-in-law at Wieden 423 (A-Wsa, TBP 116, S, 51r). At some time between January 1803 and February 1808, Barbara Disenni, née Scheiger passed away. She must have died outside Vienna, because I have not been able to find any traces of her death in the records of the Viennese authorities. Searches in the Totenbeschauprotokoll, the church records and the inventories of the civil court of the Vienna municipal court were all unsuccessful. This is a pity, because Barbara Disenni's will, had she died under the jurisdiction of a Viennese court, would have consisted of the second copy of her marriage contract that also bears Haydn's autograph signature. On the other hand, this proves that the copy which now belongs to a private collector, was not stolen at some time from the holdings of a Vienna court archive. On 8 February 1808 Franz Disenni got married again. His second wife was the 49-year-old widow of a glass cutter Theresia Hofmayer, née Hofmann. Franz Xaver Disenni died on 10 July 1827 of consumption at the age of 67 in the house Wieden 260 ("Zum Blauen Wolf", last CNo. 473, today Schleifmühlgasse 5). From his will, signed on 9 April 1827, we learn that in 1815 Paul Johann Sirbeck had bequeathed 1,900 fl to his wife's niece Josepha Disenni: "6th I declare that the claim deposited with Leopold Wagner and his wife Katharina consisting of 1,900 gulden in Court Chamber bonds from 1815 with 2,5% interests in C. M. (Assimilated Coinage) belongs to my daughter Josepha Disenni as an asset bequeathed to her by my brother-in-law Johann Paul Sirböck and should remain with her as her property." At the time of her father's death Josepha Disenni was working as "Marchand des Modes" (fashion saleswoman) and lived at the "Kleines Königsklosterhaus" on the Windmühle (Windmühle No. 69, today Gumpendorfer Straße 14). In her father's Sperrs-Relation she once is also addressed as "Stubenmädchen" (parlour maid). Josepha Disenni given as Franz Disenni's only child and "l.[edigen] St.[andes] Marchand des Modes an der Wien im kleinen König Klosterhause" in her father's probate records (A-Wsa, Mag. ZG, A2, 2820/1827). The handwriting is that of Anton Slabe (1787-1860) who in 1828 was the Sperrskommissär of Franz Schubert's estate. I have not yet been able to shed light on Josepha Disenni's life after her father's death and to determine her date of death. The fact that she inherited 1,900 gulden in 1827 makes it very likely that she got married at a later time which – owing to the change of her name – makes it difficult to pick up her trace again. She turns up in the sources in 1830 as living with her stepsister and her stepmother Theresia Disenni at Wieden No. 473. The Disenni family on an 1830 conscription sheet of Wieden 473: "[Apartment] 4 Theresia Dißennin [born] 754 Beamtensgattin Witwe / Diesseny / Tochter Josepha / 803 / St:[ief] T:[ochter] Theres: Hofmayr / 795". As a matter of fact, Theresia Hofmayr was the daughter and Josepha Disenni the stepdaughter (A-Wsa, Konskriptionsamt, Wieden 473/34r). 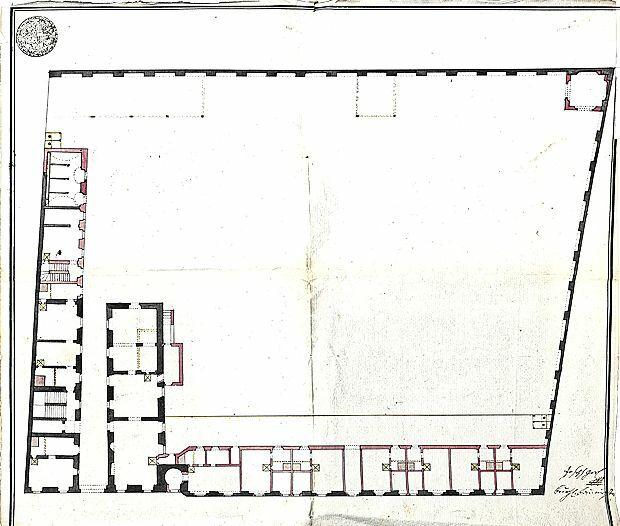 In August 1830 the Vienna Magistracy, which had been unable to determine Josepha Disenni's whereabouts, published a citation in the Wiener Zeitung in which Disenni was requested to come forward on the occasion of the upcoming auction of the house Landstraße 159 (today Schimmelgasse 2-8/2). That Disenni was listed as "Satzgläubiger" (hypothecary creditor) of this house shows how she had invested her inheritance. It is not yet known if Disenni showed up at the auction, but future research in the Landstraße land registers will probably yield more information on what became of her after 1830. Josepha Disenni's stepmother Theresia Disenni died on 19 February 1847 at the age of 92. Her probate records (A-Wsa, Mag. ZG, A2, 653/1847) reveal that she had received an annual pension of 233 fl 33 x which was one third of her late husband's salary of 700 gulden as Landrechtskanzlist. In her Sperrs-Relation her stepdaughter Josepha is not mentioned anymore which of course does not necessarily mean that in 1847 she was already deceased. A number of issues concerning Haydn's godchildren still need additional research. The source studies of Schmid and Csatkai were not extensive enough and were sometimes carried out in an almost occasional manner. The church records of Eisenstadt and Süttör need to be browsed systematically. Likewise the records of the Gumpendorf parish in Vienna have also not been subjected to the necessary research. The geneological research on Haydn's relatives that Ernst Fritz Schmid did for his book Joseph Haydn, ein Buch von Heimat und Vorfahren des Meisters (Kassel, 1934) needs to be extended and updated. Especially those members of Haydn's family that Schmid did not consider relevant for his proof that Haydn was "a purely Aryan composer" received a rather cursory treatment. One of several examples is the following: according to Schmid Haydn's niece Anna Katharina Frölich "in 1800 was already married to the shoemaker Kaspar Loder in Vienna" and "Anna, the only daughter from this marriage, was born in 1800". The truth is, this shoemaker's name was not Loder, but Loderer and his marriage to Haydn's niece took place but on 1 March 1802 at St. Florian's in Matzleinsdorf. The fact that on 5 May 1801, in paragraph twelve of his will, Haydn already takes his niece into consideration with the words: "Der Schusterin Anna Loderin in Wien 200 fl" ("To the shoemaker's wife[!] Anna Loder in Vienna") proves that he was lied to by Loderer and his future wife who told Haydn that they were already married so that Haydn would give Loderer the promised start-up capital of 1,000 gulden more than one year earlier. To figure out the exact date of Peter Rampl's birth would need the baptismal records of Přibyslav to be put online. So far only the marriage records of this town are digitally available. As far as Peter Rampl's still unknown date of death is concerned, I have unsuccessfully browsed the death records of several towns, such as Znojmo, Brno, Jihlava and Bratislava. Three biographical dates of members of the families Scheiger and Disenni still need to be determined: a) the date of death of Haydn's sister-in-law Barbara Scheiger, née Keller, b) the date of death of her daughter Barbara Disenni, née Scheiger, and c) the date of death of Haydn's goddaughter Josepha Disenni. Finding out when and where Barbara Disenni passed away could shed some light on a rift that seems to have occurred after 1803 between Haydn and the Scheiger/Disenni families. My experience has taught me that when a wife of a minor state official, who is leading a peaceful life on the Wieden, suddenly disappears and dies outside of Vienna (and not during a sojourn in some spa town, like Baden), something out of the ordinary must have happened. In his first will, dated 5 May 1801, Haydn bequeathed 300 gulden "der verheuratheten Düsseni gebohrner Scheigerin" and the surprisingly high amount of 900 gulden to the silversmith Carl Scheiger and his wife. When Haydn drew up his second and final will in 1809, the first amount of course was cancelled, but the Scheiger couple also was taken from the list of heirs. Especially surprising is the fact that Haydn – who in his final will took several marginal figures into consideration – failed to transfer some of Barbara Disenni's inheritance to her daughter Josepha, who after all was his godchild. In 1801 rumors began to circulate that Haydn was to be commissioned by Empress Marie Therese to compose an oratorio entitled "The Last Judgement". In October of that year this project was announced in an article in the Allgemeine Musikalische Zeitung in which Haydn was said to have expressed the intention to have Wieland write the libretto. For two reasons this project was never realized: first, at the age of almost 70 Haydn's health and creative energy were beginning to fail. And second, some of his aristocratic patrons urged him not to accept a commission from the empress. Especially Baron van Swieten decidedly spoke out against this project. On 21 October 1801 Griesinger wrote to Breitkopf & Härtel: "The rumor that Haydn is composing The Last Judgement is completely without foundation, but it is true that the empress wanted to urge him to do it." On 4 November 1801 Griesinger addressed this topic again: "The empress still wants the composition of The Last Judgement, but Swieten is very much against it. In the meantime a young poet from here is undertaking the arrangement of the text in four parts: Death, Resurrection, Hell, Heaven. Haydn could still give in; he says the idea seems crude, but can be used perfectly for a musical representation on a grand scale." This oratorio never materialized. But a handwritten libretto survives in the Esterházy archive with the title: "Das jüngste Gericht in Musik gesetzt von Herrn Joseph Haydn verfaßt von J. Ignatz Scheiger Pfarrer in Kirchberg am Wagram". That the priest and poet Ignaz Scheiger was involved in this oratorio project has long been known to Haydn scholarship. What has not been known is the fact that his collaboration could hardly have been a coincidence, because Scheiger was a nephew of Haydn's wife. Joseph Ignaz Scheiger was born on 17 February 1760 in Vienna (A-Wd, Tom. 84, fol. 30r, see the above list of Barbara Scheiger's ten children). He became a priest and at a relatively young age made a name for himself as a writer of poetry. During the 1780s he was a regular literary contributor to the Wiener Musenalmanach which was published by Ratschky and Blumauer. The 1786 issue, which contains Mozart's "Lied der Freiheit" (K. 506) and where Mozart found the text of Baumbach's "Als Luise die Briefe ihres ungetreuen Liebhabers verbrannte" (K. 520), also contains poems by Scheiger, for example "Der Löw und der Bär". 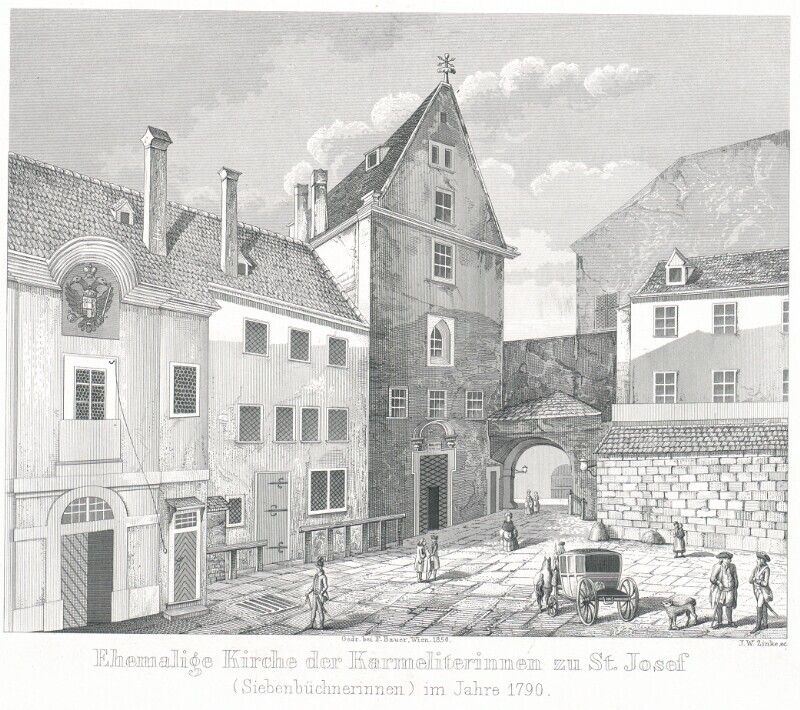 In the 1780s Scheiger lived in Graz where he was a member of the Masonic lodge "Zu den gereinigten Herzen". In 1792, when he published his Fabeln und Erzählungen, he was serving as vicar in Laa an der Thaya. In 1798 Scheiger was appointed minister in Kirchberg am Wagram where he lived for the rest of his life. In 1831 he published a collection of poems which in its time enjoyed considerable popularity. Joseph Ignaz Scheiger died on 19 August 1835 in Kirchberg am Wagram. 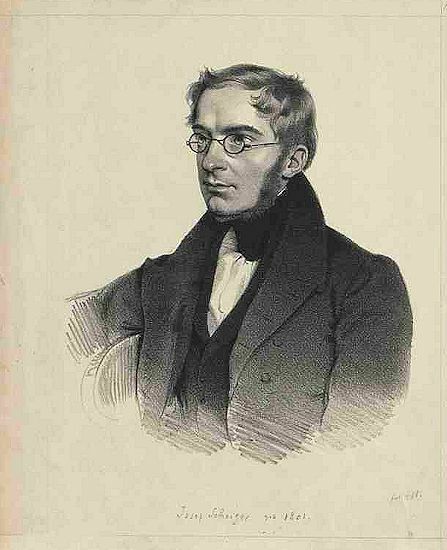 The most prominent bearer of the name Scheiger was the Austrian historian Joseph von Scheiger, who was born on 3 February 1801 in Vienna (A-Wstm, Tom. 18, fol. 199), son of the "bürgerlicher Goldarbeiter" (civil goldsmith) Joseph Scheiger (1759-1819). A pioneer of historical topography and the first serious archeologist and historian of Austrian castles, Scheiger was ennobled in 1872 and died on 6 May 1886 in Graz. Scheiger published a number of significant works, among them the priceless handbook Der Fußreisende in Österreich which was published in 1827. Joseph von Scheiger's second wife was Katharina Prato, one of the most widely read authors of cookbooks of the nineteenth century. I have not been able to conclusively prove a family relationship between Joseph von Scheiger and Carl Scheiger, the brother-in-law of Haydn's wife. But the fact that von Scheiger's father Joseph and his elder brother Karl were goldsmiths and Karl Scheiger jr. (Frau Haydn's nephew) was a silversmith, suggests a family connection. That Joseph von Scheiger and Haydn's goddaughter Josepha Disenni were cousins, depends on the still unanswered question, whether Joseph's grandfather, the gardener Leopold Scheiger, was a brother of the wigmaker Carl Scheiger who in 1752 married Haydn's future sister-in-law.